I have a bunch of concept designs to share with you all today. We'll start with the Florida Panthers. 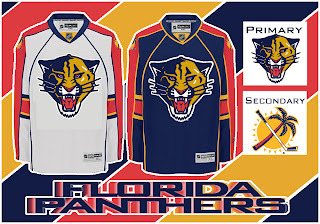 This concept keeps the same uniform design while simplifying the primary logo to feature only the panther's head. I'm not a fan of the rounded elements, though. I think the sharp edges offered a fierceness that this logo lacks. I was also emailed a couple of New Jersey Devils designs. 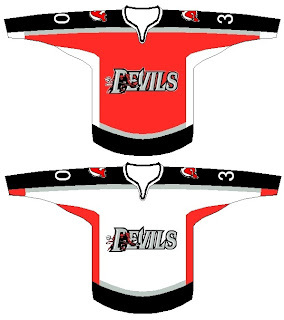 These concepts borrow from the AHL's Lowell Devils logo, relegating the current primary to the shoulder. Personally, I couldn't see the Devils converting to a minor league logo. That would just be strange. And finally, someone emailed me some St. Louis Blues art. I've always wanted to see the Liberty Bell in a secondary logo for the Philadelphia Flyers. Along the same lines, I've also been curious to see the Gateway Arch as a secondary for the Blues. But not quite like this. 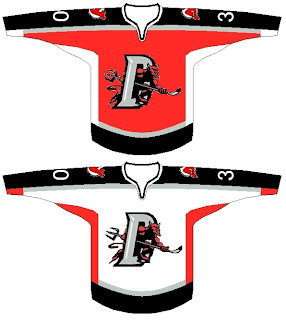 This design was suggested as a possible future third jersey. It needs a little yellow and some work on the logo, but it certainly has potential. Thoughts?